Welcome to week 2 of the 2014 SciFund Challenge outreach training class for scientists! How do we craft a clear and compelling message from our science? That’s what we’ll be focussing on this week. The center of this week is a communications technique called the Message Box. This technique was developed by COMPASS, a fantastic organization that provides communication training to scientists. I can tell you from personal experience that their training workshops are incredible. COMPASS has permitted us to use their materials and I would personally like to thank them for their generous assistance, particularly Nancy Baron and Liz Neeley. Nancy has written an amazing book, Escape from the Ivory Tower, from which we’ll be reading a chapter this week (more on this below). Part 1: Read about the Message Box and prepare two versions of it for yourself. Part 2: Practice using the Message Box with a class partner. Part 3: Talk about the experience of crafting your message in group discussion sections, using Google Hangouts. Part 4: Keep going with Twitter. 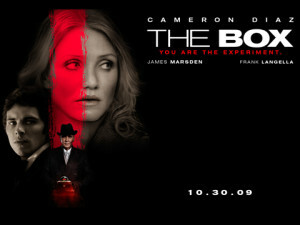 Did Cameron Diaz get the Message? Let’s hope she read Nancy Baron’s book. Part 1: Getting ready. The Message Box is a structured method that scientists can use to craft their science messages for nonspecialist audiences. This technique is frequently introduced as a way for researchers to effectively communicate with journalists and, in fact, our use of the Message Box will feature a back-and-forth between a scientist and a (pretend) reporter. But this technique is about a lot more than just media training, as the journalist is really a stand-in for the audience with whom a researcher is attempting to communicate. So, whether you are planning on becoming the next talking head on CNN or just want to explain to your Mom what you do all day, the Message Box is a great place to get started. Reading assignments. Nancy Baron has written the bible for science communication, Escape from the Ivory Tower. She has extremely generously allowed us to have a copy of the Message Box chapter from her book (chapter 8), free of charge. Please read this chapter, which you can download on the Google+ page for the class (look for it under the category of Week Two). For obvious reasons, we can’t link to the specific chapter from this blog. Towards an enhanced theory of aerosol manipulation. As a second reading assignment, please read Communicating the science of climate change, which came out in Physics Today three years ago. The section of the article to focus on is Better Communication. This article really makes clear how words can really get in the way of science communication – sometimes in very unexpected ways. 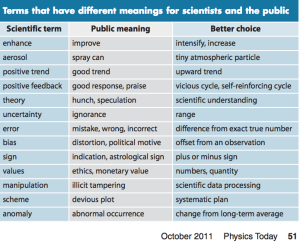 Many scientists already know that the use of jargon can make it hard to talk with people not in their field. But the article discusses a more insidious problem, namely with language that has a double meaning (one meaning for the public and another for the scientist). Read the article to learn how to dodge this particular minefield. Preparing your Message Box. Using the guidance from Nancy’s book, please prepare two Message Boxes for your own science. At the following link, you’ll find a blank version of the Message Box form. Why two Message Boxes? Because, contrary to conventional wisdom, there is no such thing as the general public. Instead, there are multiple potential audiences. Across your possible audiences, what is compelling (and what is unintelligible jargon) might vary tremendously. For this exercise, prepare a message box for two of the following three categories of people. Part 2: Using the Message Box. Our Message Boxes will be much better if we can bounce them off a real live human. So, for part two of this week, we’ll be pairing off with another class participant to practice using our Message Boxes. On the Google+ page for the class (look for it under the category of Week Two), you’ll find a table where you can find other class participants to partner with. Try to find a partner who is not in your field. By Thursday, please connect on your own with your partner to do the following role-playing exercise. To get more practice with Google Hangouts, I would recommend you connect using that method. In the exercise, the two partners will interview each other, taking turns in the roles of the Scientist and the Journalist. Each of the four interviews (two Message Boxes for each partner) should take on the order of five to ten minutes. For this to work, obviously both partners will need to have completed their Message Boxes prior to the conversation. Don’t share your Message Box with your partner! Only tell him or her the general issue and the audience you are addressing. The Journalist should initiate the interview and say that he or she would like to write a story involving the Scientist’s issue. The Journalist should be sure to ask lots of questions, coming from the perspective of the audience being addressed. If the Journalist doesn’t think something the Scientists says makes sense (for the particular audience), he or she should immediately (but politely) speak up. Keep an eye out for jargon and double-meaning language. Part 3: Group discussions. Once you have done your partner interviews, let’s talk about it! We have scheduled a series of Google Hangouts for facilitated group discussions for the end of this week, similarly to last week. You can sign up for a hangout on the Google+ page for the class. Part 4: Twitter. Let’s keep rolling with Twitter, being sure to use the #SciFund hashtag so we can find your tweets. If you find Nancy’s book chapter to be useful, please send her a tweet (@Nancy_Baron) telling her so. Send at least three tweets giving your reactions to the book chapter and Physics Today article assigned for this week. Send at least three tweets, either giving or asking for advice with your Message Boxes.